The Budget is coming at the time when the economy is going through a slowdown because of structural reforms such as demonetisation and implementation of the goods and services tax or GST. With dim hope of any revival in private investments, all eyes are on Budget 2018 for the much-needed push to the economy. The Budget is coming at the time when the economy is going through a slowdown because of structural reforms such as demonetisation and implementation of the goods and services tax or GST. One of the topics discussed at the Business Today MindRush, held in Mumbai on January 13, was -- "Union Budget: Any scope for Good News?" 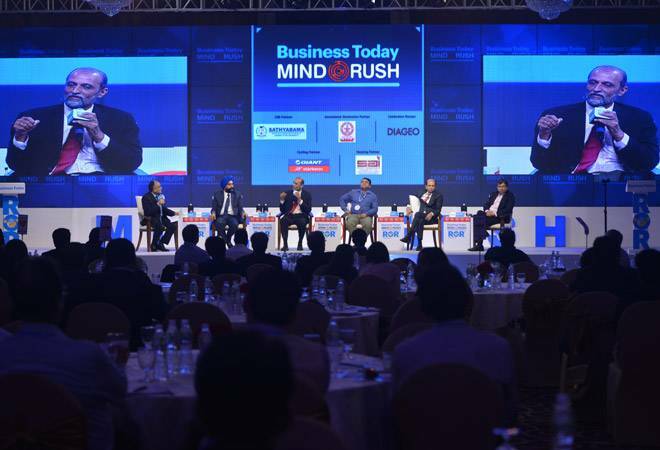 The panel discussion was moderated by Rajeev Dubey, Editor, businesstoday.in and Business Television. The panel comprised R.S. Sodhi, CEO at Amul, Ajit Ranade, Chief Economist at Aditya Birla Group, Nimesh Shah, MD and CEO of ICICI Prudential Asset Management Company, Saugata Gupta, CEO of Marico and Soumya Kanti Ghosh, Chief Economist at SBI. Talking about the challenges before the government which are likely to be addressed in this Budget, Sodhi said: "Sixty-eight per cent people are living in villages. We need to provide better skills to rural India. Moreover, when it comes to agriculture, we have to also think about things such as horticulture where productivity is higher. Animal husbandry is another area to look at. The government should provide more budget for creating jobs in rural India than urban India." Ranade of the Aditya Birla group, said, "The focus should be on providing more jobs, as the challenge is to create 12-13 million jobs per year. We are seeing youth unrest, which needs to be taken care of." Ghosh of SBI, however, said that the story of jobless growth is a little bit exaggerated. This is clear if you look at data such as increase in provident fund accounts, he said. "Though jobs have to be created, the most important thing is women's participation, which is declining," he said. On GST, experts said that though it has been a landmark reform, it will take a couple of years before the benefits start kicking in. Ghosh said, "There are several benefits relating to GST but there are teething problems too. Considering that the global economy is on the upswing, it will be another couple of months before you start seeing the benefits of GST." Nimesh Shah of ICICI AMC said, "It is a huge challenge that the government has taken. It will have problems and I think it will be three years before everything stabilises." Gupta of Marico agreed and said: "It is a bold reform and will create a level-playing field for ethical businesses." Despite two seasons of good monsoon, most experts agreed that the economy has not recovered. But they hoped that the rural economy will start doing better before elections. On the big surprises expected from the budget, Ranade, said, "Expect the long-term capital gains period to be increased to three years to bring parity with other asset classes." On protectionism and nationalism, Sodhi of Amul gave an example of edible oil in which India was self-sufficient. "Today, 70 per cent is imported. It happened when the government started free imports to provide cheap oil. It kills the industry and is not good for the consumer in the long term." Ranade said, "If you want to develop strategic advantage such as steel and automobile, you need an intelligent import policy."